Sedona is filled with scenic wonders. Huge red rocks in varied shapes and sizes point upward to spectacular skyscapes above. 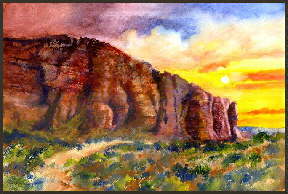 Click here to check out prints and cards of Sedona landscapes. 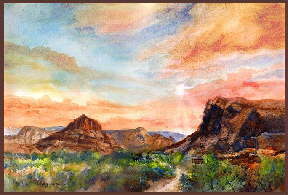 Here are three more watercolor paintings of Sedona. I tried to depict the spectacular beauty of Sedona, Arizona, and the various moods that special area can experience -- from serene sunsets to light shimmering from the land below spacious skies. gentle whisps of white spreading across the sky. arching above the land below. And I give You thanks.